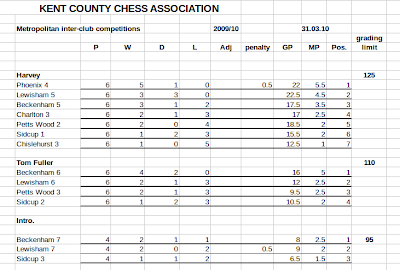 A friendly Sidcup-based chess club in South East London. Click on Contact Us if you are interested in coming to our club; we welcome new players. John Rowe died in his sleep on 7th April 2010. He had been an enthusiastic member of the club since December 1989, when he joined as a pensioner. He was still coming regularly to the club until three weeks before his death. He will be sadly missed by all. Not a very good evening for us after our good win a few weeks before; I was at least hoping for draw. Lewisham had their number 1 player drop out the night before so they had to bring in John Allen as acting Captain for the night (the father of Thomas). John is rated 159 and consequently, this pushed their average ratings above the legal limit, leading to a half point forfeit. Derek Johnston was the first to lose, going down a piece early on in his game which he never really recovered from. After that, we all went down during the course of the evening one by one. 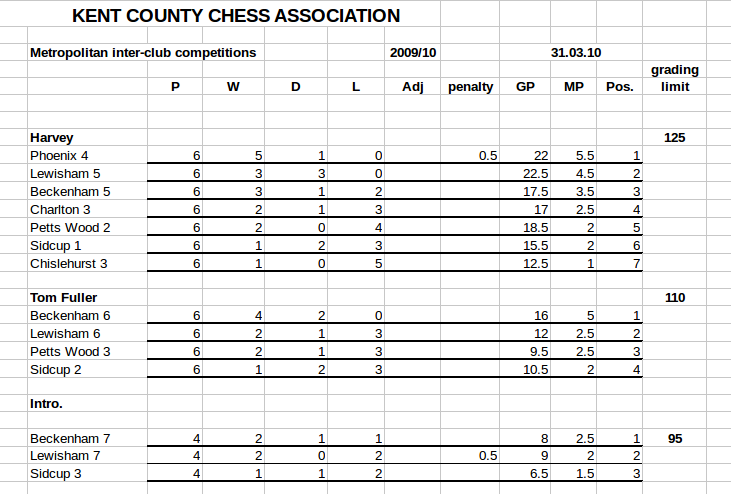 I think perhaps Phil Broughton put up the best fight, only losing out to a promoted pawn he could not stop. So in the end it must have been sweet revenge for Lewisham trouncing us 3.5 to 0.5. It was pity as losing the match, we finished 3 out of 3, but it was close thing in the end, as had we had won that, we would have finished equal top perhaps only finishing second in the league on games diff.